If only I could fix this one problem with my horse. I’ve seen this so many times where people say I want this one problem fixed with my horse then everything will be ok. What they don’t realize is if there is not a foundation in place their problems are only beginning. I have to then ask them “Have you put a foundation in place with your horse? Most of the time the answer what do you mean? As an example I know of someone who recently purchased a young horse with the intention of showing in the Western Pleasure classes. 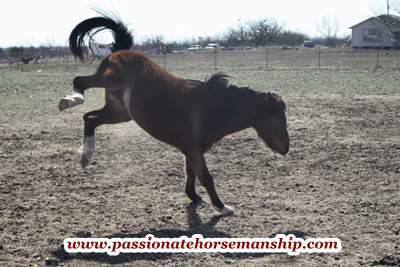 This young horse had no foundation had never been shown plus the rider is inexperienced and not a trainer. For the foundation he should have been started out on the ground as he had no clue what was expected of him. The rider’s only goal was to have him lope slow for the Western Pleasure classes not taking into consideration the importance of moving the hindquarters the forequarters and more. The horse was sent to a trainer for six months where he was pushed and got so frustrated that he started bucking or trying to rub you off on the fence. This young horse went from Kindergarten to College in a short period of time and was expected to perform at a higher level. I don’t know of anyone that would build a house without a foundation or send their child from Kindergarten to College in a six month period but yet a lot of people do this to their horses. This is the problem people want the one thing fixed without putting a solid foundation on their horse. Without a proper foundation what I’ve seen is that people try to fix the one problem then others arise. Like with the young horse now the bucking and trying to rub you off on the fence needs to be fixed and this all started out of frustration. I think the saddest part is that this young horse started these bad habits because of people not taking the time he needed and now if the problems can’t be fixed who knows where he will wind up. I believe that if this horse would have been started out with a solid foundation and given the time to understand what was being asked of him these problems would not have happened. All of the horses I get in for training and even my horses get a solid foundation before being started or restarted under saddle. A great way to do this is by starting with the basics of leading by walking, stopping and backing. I also take them through the Horse Agility course. All of my students in the Horse Agility course have said that it has made a huge difference for their horses, ridden or not. Be a student of the horse and give them a solid foundation. There are to many horses out there without a good solid foundation and many will wind up in slaughter pens. I encourage you to check out Horse Agility as it is for any equine ridden or not and will make a difference. Would you like to give your horse a solid foundation and have a horse that is safe and dependable? I can show you how contact me today to schedule lessons.